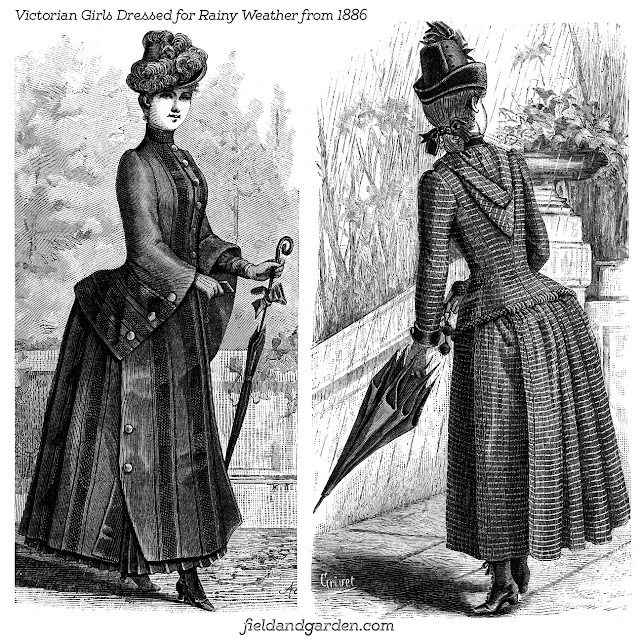 A collage sheet with two black and white illustrations from 1886 showing a pair of Victorian teenage girls dressed for rainy fall (autumn) weather. Both are carrying umbrellas and wearing thick woolens. You can download the free high-res 10" x 10" @ 300 ppi JPEG without a watermark for use in crafts, a walk journal, collage art making, scrapbooking or card design projects here. All digital scans by FieldandGarden.com are licensed under a Creative Commons Attribution 4.0 International License. Please cite FieldandGarden.com as your source when using this work and/or provide a link back to this page.